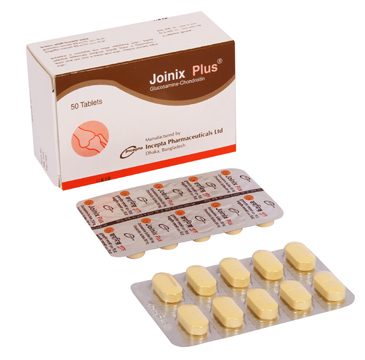 Joinix Plus Tablet: Each film-coated tablet contains Glucosamine Sulfate USP 250 mg and Chondroitin Sulfate USP 200 mg.
Joinix Plus tablet is a balanced combination of two leading natural supplements of healthy cartilage - Glucosamine and Chondroitin. Glucosamine is a naturally occurring amino sugar of cartilage that provides the basic raw material needed by the body to manufacture joint cartilage. And Chondroitin is another naturally occurring mucopolysaccharide of cartilage that stimulates cartilage production, inhibits cartilage destroying enzymes, draws fluid to the cells and helps lubricate the joints. They work synergistically together to help stimulate the production and regeneration of connective tissues (e. g., cartilage, bone, tendon, skin, mucous membrane, blood vessels etc.). Indicated for the treatment of osteoarthritis of knee, hip, spine, hand, and other locations as a dietary supplement. It is also beneficial in rheumatoid arthritis, sport injuries, migraine, different skin problems (e.g., psoriasis), vascular complications (e. g., atherosclerosis), kidney stones, and inflammatory bowel disease (e.g., ulcerative colitis, leaky gut syndrome). 1 to 2 tablets three times daily or as directed by the physician. Obese individuals may need higher doses, based on body weight. Both Glucosamine and Chondroitin Sulfates are virtually nontoxic. Side effects are rare and are limited to stomach upset, nausea or diarrhea. These usually disappear when the tablet is taken with meals. Diabetics are advised to monitor blood glucose levels regularly while taking Glucosamine. No special studies were formed in patients with renal and/or hepatic insufficiency. The toxicological and pharmacokinetic profile of the product does not indicate limitations for these patients. However, administration to these patients with severe hepatic or renal insufficiency should be under appropriate medical supervision. Women who are pregnant or who could become pregnant should not supplement with Glucosamine and Chondroitin. They have not been studied enough to determine their effects on a developing fetus, and no studies have evaluated the use of Glucosamine and Chondroitin during pregnancy or lactation. It should be taken with caution and medical advice during pregnancy and lactation.